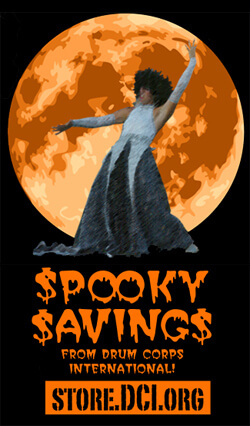 Savings so good, they're scary! – During Drum Corps International's "Spooky Savings" sale, you'll be able to buy two DVDs and get a third DVD of equal or lesser value for free! Choose from any Division I Finalist DVD from 2000-2006 or mix and match with any DVDs from the entire Legacy Collection. Also included in this limited time only promotion is a markdown on the 2007 Midseason DVD now only $19 each. Become the proud owner of the complete 26-volume Legacy Collection, originally $499, now only $449. This "spooky sale" ends Friday, Nov. 2 at noon Central time. Act today to fill out your Drum Corps International DVD shelf or to start the drum corps DVD collection you've always wanted. Don't forget that DCI DVDs make great holiday gifts! Call 800.495.7469 x3 or order online today.